– Previous owner for 34 years!! The engine runs very well, drives goes into gear etc. New radiator fitted in the last few years. It has Overdrive. The gauges all seem to work fine. It has been sorned since 2011 but started regularly. It was repainted some years ago in Ford Blue, which still looks great but is showing some signs of ageing. All the panels are very straight. The chrome is good too but not perfect. The convertible hood is in nearly New condition. The interior is in good shape, the carpets are good as are the black leather seats. It has only been used in fair weather and constantly garaged over the previous owners 34 years ownership!! He has owned the car since 1979!! It has had 4 previous owners in total. Due to health issues the car is up for sale. The car does suffer with some rust in the boot area and on the sills, This is the main issue with this car, which will need seeing to, It has been treated with under-seal in the past but will need some more attention to make it roadworthy. 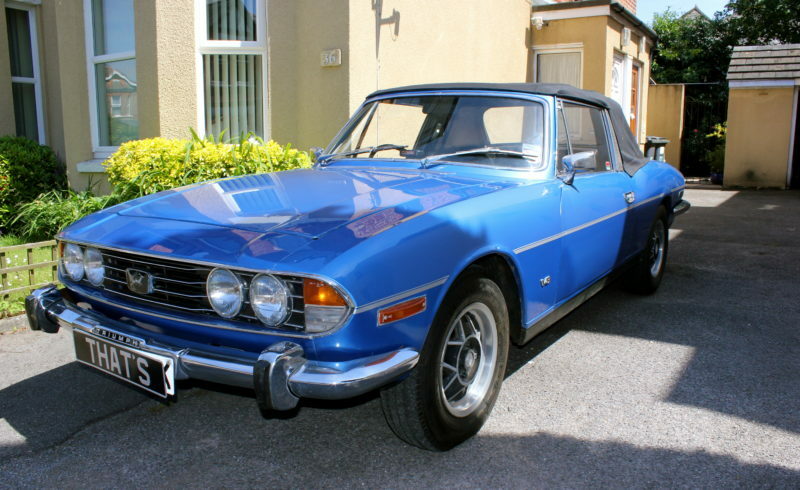 Overall this is a great base for a restoration project and excellent opportunity to acquire an original mark 1 Triumph Stag from 1971 with the original engine. Very rare .